The Tanran Reiki Dai Ko Myo progression set, so you can tune into the different energies of each version of the Symbol. Price per set including postage within Australia $25.00 regular post, $29 registered, insured. The coloured background of the cards also matches the commonly used chakra colours, although please allow yourself to see the chakras in other colours. Dai Ko Myo is the Master symbol, it connects us to the divine energies of the Universe, it comes for a place where we are all one, all connected all equal. It is the connection to Unconditional Love that surrounds us all. The Dai Ko Myo connects with the crown Chakra and serves as a link with all other symbols. And for me I see the orginal Tanran Reiki Dai Ko Myo in the crown, and the others sitting in the aura above the crown. 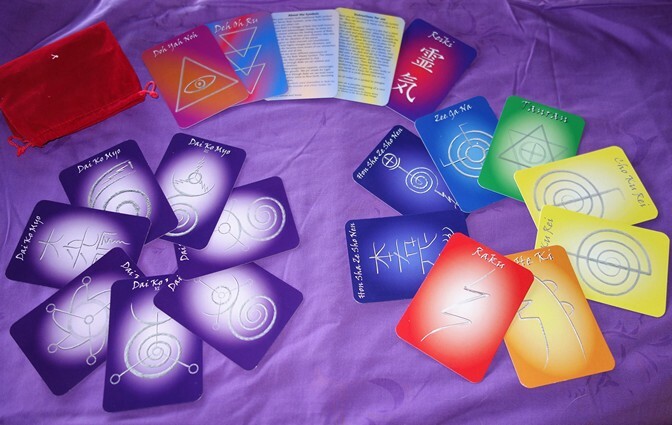 There are seven versions of the Dai Ko Myo in the deck, the first 2 (the traditional Kanji, and the original Tanran Dai Ko Myo) hold the same energy of connection. The later versions 3-7 to me bring in the energies of the originals and also expand the energy to bring in more ‘cosmic’ energy energies that link us in greater harmony with universal forces and other dimensions. These show an ever evolving pathway, a pathway of love and connection to all that is, all the has ever been, and projecting out into the future helping us welcome and accept changes that must come with conscious evolution. The Dai Ko Myo connects with the crown Chakra and serves as a link with all other symbols. I am one with the great light which manifests as Love, wisdom and creativity, I relax into infinite joy and peace. 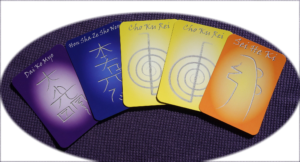 Hon Sha Ze Sho Nen is the distance healing symbol, it is represented in the cards in both its traditional (Kanji) form and the Tanran Reiki form. The Hon Sha Ze Sho Nen is associated with the Third eye or brow Chakra, The energy is a strong energy of connection including backwards and forwards in time, to past and future lives as well as this lifetime. Zee Ga Na, is the symbol associated with the throat chakra. It has a poweful clearing and cleansing energy allowing and aiding us to cut ties with or let go of things from the past that no longer serve. Tanran is associated with the Heart Chakra, It embraces the energy of unconditional love (which to me is the absolute energy of Reiki) and it helps link the lower chakras of Matter to the upper chakras of spirit. It is a symbol that brings us into balance, and helps us to be guided by our heart in all that we do. Sei He Ki is associated with the belly or Sacral Chakra, and is another of the traditional Reiki symbols. Sei He Ki is a deep healing symbol particularly for emotional trauma. It comforts and nourishes the Inner child. Raku is associated with the Base or Root Chakra, Raku Supports ans strengthens this Chakra which is the foundation of who you are. It is a primal energy the will to survive. Doh Yah Noh This symbol is not associated with any particular Chakra, it can be used to seal the aura, and as such has a sense of protection and security. Deh Oh Ru is not associated with any chakra in particular, but supports the movement of energy up and along the spine between the chakras. It is a spinal alignment symbol the can be used to promote movement from the the base human desires to higher ideals of the service and oneness imbued in the upper chakras of spirit. Rei Ki or Reiki, this is the Japanese Kanji symbol for the loving transforming energy of Reiki. The energy that knows what each person needs and wants to heal them instantly. In Reiki we are all part of the web of energy and light on the planet. And as Reiki channel and/or practitioner you are Light, a light worker, who helps bring light into the darkness of others and illuminate your own shadow.